My Sackboy crochet doll is almost finished — I still need to pick up a zipper, contrasting yarn for his stitches, and black felt for his mouth, but here he is all put together and wearing a festive scarf / self-adhesive elastic bandage. His eyes are a little ghetto because I haven’t had time to get to the store for a set of matching buttons and wound up using one half-spherical black one that was perfect, and one flattened pink disk button that I “enhanced” with a black Sharpie marker. Anyway, this wasn’t that tough, and I’ll probably be making a small army of them in the near future as gifts for my gamer friends. Final pics (after zipper, mouth, and stitches) soon. 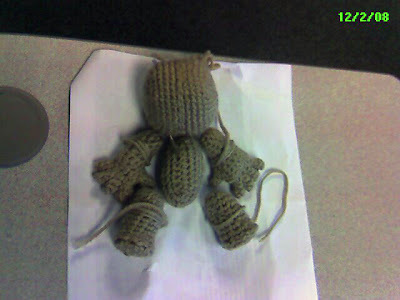 If you want to make your own, all you need are a basic knowledge of crochet (single crochet, working in the round), yarn, a crochet hook (size 5 or 6 – $1.50 or so at your local Ghetto Mart), one large-eyed, blunt-ended tapestry needle (also available cheaply at Ghetto Mart), and the Sackboy crochet pattern by RichmondArt at Etsy.com. For as long as I have been reading your blog, your term Ghetto Mart always makes me laugh. Even though I left a note, he still insisted that I was playing some type of game with him so I explained again that those things shaped like stars and gingerbread men were not cookies. He finally decided to trust my judgement and told me “Fine, but they smell like they should be cookies” and made his way downstairs like a kid that had just been told that Santa Clause doesn’t exist. The whining shall continue today as I plan on making another batch of ornaments that smell like cookies but are not. 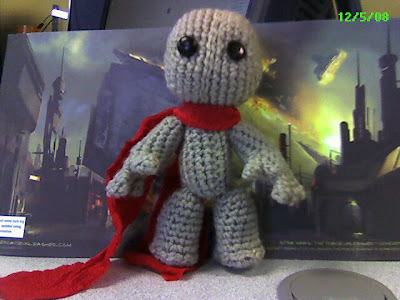 LOL Sackboy is very cute by the way. I got this and thought of you, as you’re so good at passing along your fitness booty (I couldn’t help myself). For 10% of all orders at RoadID, http://www.roadid.com, until 12/17: PCHOLIDAY283. 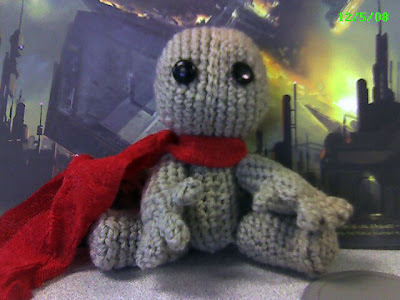 i loveeeeeeee your sackboy so far, I just got the game yesterday for Xmas and Im obsessed with the little guy. I bought the crochet pattern from a seller on etsy.com — I can’t wait to work on mine!